This is a great way to expand me and my daughters’ pom pom making skills. The book is very high quality, with top-notch layout and photography. The step-by-step instructions are very direct and clear. Much of the instructions for each are carried in an infographic type illustration, with separate instructions how to use those graphics to create each one. These illustrations show the exact methods for making each of the 45 different animals, including specific tips on how to tease out the felt for the ears. Although ours are not as perfect as the authors, we are having great fun making them. I find my daughters (and myself) paging through the first half of the book, which is largely just photos of each project, with the instructions following. It’s a genius layout since each animal is so cute, the book would be worth it just as a coffee table book of cuteness. Just delightful! I was glad to get my daughter this handy guide to doodling Japanese-style cuteness. I should be clear that it’s not about manga-style illustration, but the simpler, more authentic type of illustrating in a natural, “doodling” style. The book has a clever layout, with simple instructions, and then a wide range of hundreds of everyday objects to doodle, in a step-by-step process in little boxes for each drawing. She’s going through the book, memorizing the little tips, and already seems to feel better about her hand-drawn illustrations while her quality is noticeably better. She’s delighted with the book, along with its hundreds of little tips, like making little dashes on breads to make them look toasted — something that’d never occur to me, but looks perfect in practice. So, while the book is definitely appropriate for even young children, it’s also a great guide to broadening one’s professional illustration skills. By reading through it myself, I’m adding several of these tips to my own graphic designs. That said, this is just a super fun book for anyone to go through, with even mild interest in drawing. We’re all delighted with this wonderful book! Succulents and mosses and such are so popular now. I’ve seen some really fabulous terraniums at my friend’s apartments and offices, but the one’s I’ve found in stores didn’t seem to hold up to the level of “design” or they simply outgrew their pots in few weeks. So I’m taking matters into my own hands with this excellent guide. There are 47 different projects that would suit any taste or surroundings. I’ve made a few succulent terrariums, but the moss based ones have caught my interest now. The book is very well designed, with a nice layout, good printing, with great photos and clear and helpful text throughout. 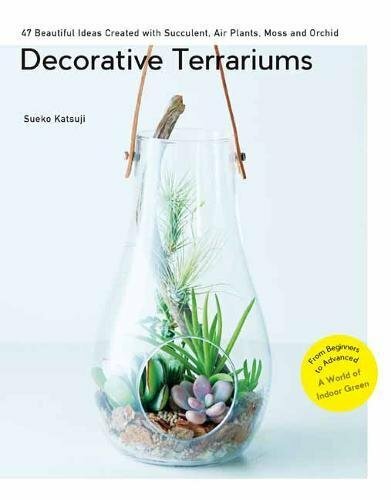 The tips offered would be a big help even to whoever designs those terrariums sold in stores. Very helpful and lovely book.